Do you want to give your walkway, driveway, or other parts of home outdoor a new look and appeal? You should install decorative and functional brick pavers. 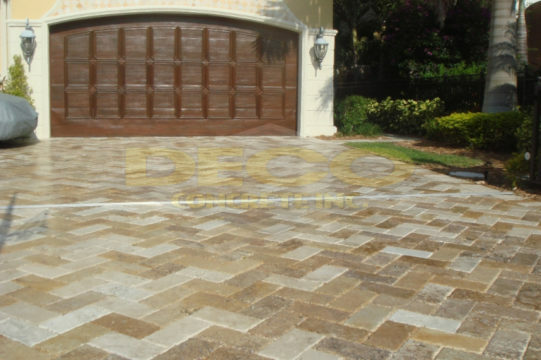 We, at Deco Concrete Inc., can be your one-stop solution for not only brick pavers but other home exterior items such as concrete pads, stamped concrete, and concrete overlays. We can be your ideal resource for enhancing the look and feel of your driveway, pool deck, or patio. Having been providing state of the art quality of equipment for more than 20 years now, we are known for our indomitable passion to provide highest quality products and good customer relationships. We understand every property is different and the tastes and budgets of every customer also vary from one another. But we can meet all kinds of requirements and transform your property in a stunning manner. So, if you need brick pavers in a great quality in and around areas like Aventura, Coral Gables, Fort Lauderdale, Miami, Parkland, or Pinecrest, then you can rely on us. Before making a purchase, you might have a few queries regarding these, especially if you are buying these for the first time. Here, we have discussed a few of them. Take a look. How can brick pavers decorate your outdoor? Brick surfaces are truly timeless and have a rich elegance which can uplift your mundane and ordinary outdoors like never before. So, you can install these at home. How should one choose the right brick pavers? First of all, you should make sure that these are of a great quality and last for a long time. After all, you are investing your hard earned money, you should make sure it is worth it. This will depend on the company from whom you are making this purchase. You can take price quotes in advance from various companies and compare them to choose a budget-friendly product. So, if you are keen on purchasing brick pavers from us, then you should contact us now.